Control Panel is the brain of Windows, this is where every Windows feature can be controlled and changed. If you are looking for ways to properly use Control Panel on Windows 10 in order to get more things done in less time then this is the right place to be at. Here you can see how to use and master Windows 10 Control Panel menu to accurately control all main Windows features that help the OS to function properly for a long time. In this post we have highlighted top 5 Windows 10 Control Panel Tips & Tricks that every Windows PC users should know to keep the copy of the operating system in tiptop condition for years to come. Control Panel remains the integral part of the Windows OS but is not as easily accessible as it was in Windows 7, Windows 8/8.1, Vista or XP. In Windows 10, Microsoft introduced new Settings app but it lacks many of the Control Panel’s features, you can only perform limited tasks with Windows 10 Settings app. Below are top 5 best ways using which you can perform some amazing tasks with shortcuts in less time. If you are struggling to locate Control Panel then see tips below for it. Here’s how you can explore Windows 10 Control Panel and use it to get the maximum out of it. On Windows 10, press Windows key + R to quickly open Run command dialog box. Then type Control Panel and hit OK to quickly open get to the main Control Panel screen. Another way of getting straight to Control Panel on Windows 1o is through Windows PowerShell feature. Click Start button, type PowerShell and click on Windows PowerShell option from the search result list to open the tool. Type Control Panel on PowerShell window and hit enter. Use new Windows 10 voice search assistant Cortana to open Control Panel. Open Cortana and either type Control Panel and select it from the search result to launch Control Panel Window or say ‘Hey Cortana Open Control Panel’ to quickly get the main control screen. Use Windows Command Prompt option to quickly open Control Panel. Like we said earlier, accessing and opening Control Panel on Windows 10 is not as straightforward as it was in previous Windows OS version. So, click Start button, type cmd and select Command Prompt to open it. Type Control Panel in Command Prompt window and hit enter. Quickest way to get to all main Windows 10 administrative features is by pressing Windows + X which brings up the list of all Windows functions you can quickly access. One of them on the list of Control Panel. Click to open it directly. 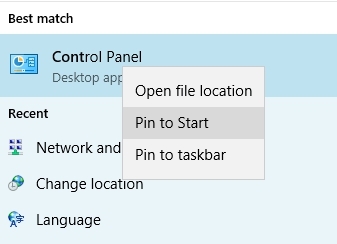 Now that you know how to open Control Panel on Windows PC/Laptop, it’s time to Pin it on the taskar to avoid searching for it repeatedly. 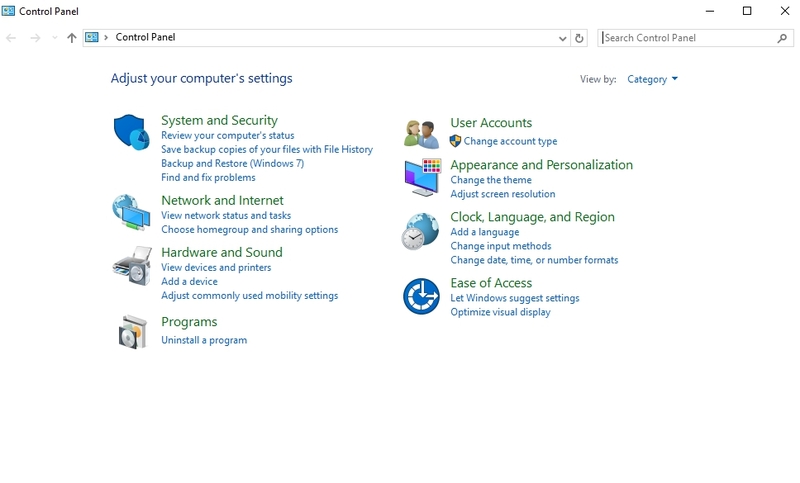 Right-click on Control Panel icon and select Pin to Start or Pin to Taskbar option from the option menu. We hope after following above tips you can start using Windows 10 Control Panel more efficiently for performing various admin tasks.